As the festival plans proceed nicely, and the programme is filling up we realise we don’t have a face painter for the Festival this year. Over the last few years, face painting has been a very popular item with visiting families with queues building up during the day. 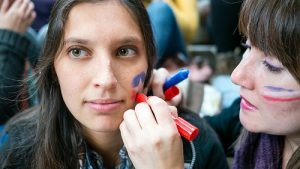 If you or anyone you know is interested in face painting, please ask them to fill in the Special Events application on the Be Involved page. Thank you. We don’t want to disappoint our children.